Will either defense step up in this game? Early on in the year, it was easy to defend for the Denver Broncos defense; their low statistical ranking was an anomaly. Von Miller was out, amongst a number of other injuries, and upon his return things got much better. However, that good play has really not been sustained. As recently as last week the Broncos defensive brain trust could be seen sitting some of the guys who started the season on a high note. Wesley Woodyard and Duke Ihenacho to name a few. On the other hand, the Chargers defense has been a woeful mess all season. Only one of their regular defensive players, safety Eric Weddle, carries a positive grade from Pro Football Focus. It is really hard to imagine this game resulting in anything but a shootout. With that being said, how do the Chargers plan on keeping up with the Broncos in that type of game? Their best bet would be to attack the middle of then Denver defense. The reason the aforementioned players were benched is because the Broncos linebackers and safeties can absolutely be had in coverage. The Chargers have the personnel to exploit some of those coverage deficiencies. 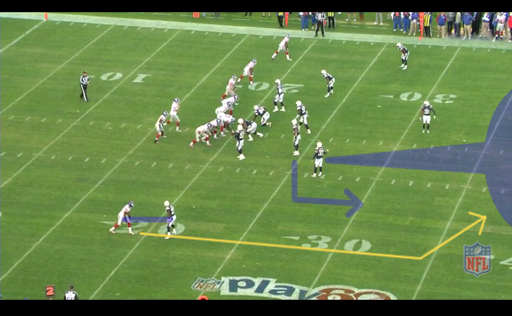 Danny Woodhead is both quick, and tremendous receiver out of the backfield. 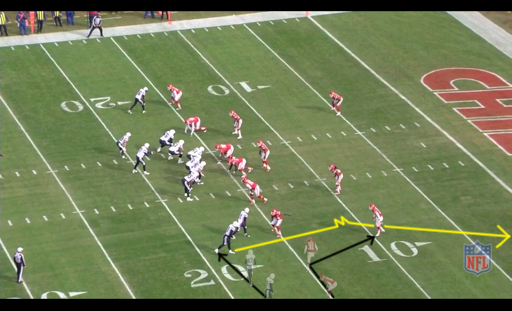 Mike McCoy and Ken Whisenhunt would be wise to find ways to get him isolated on linebackers. Despite having zero catches last week after two breakout performances, Ladarius Green should be a prominent figure in this game. The Broncos safeties do not have a prayer of keeping up with him in coverage. Properly utilizing those two players will help the Chargers score ample points, and perhaps enough to keep pace with Peyton Manning’s show. 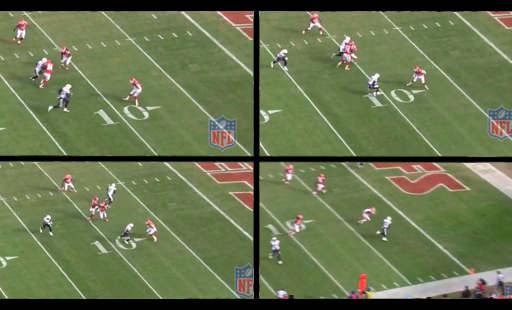 Here is the only part of the play that goes wrong, and it has nothing to do with Keenan Allen. The rookie receiver is open in the end zone for an easy touchdown, but Phillip Rivers puts the ball just out of his reach. 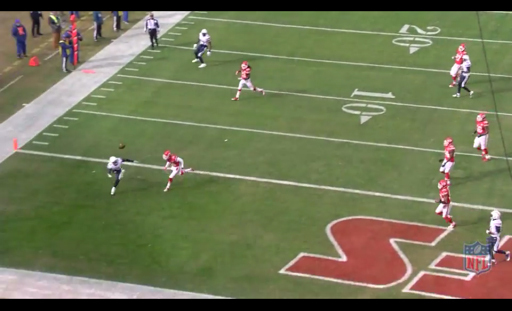 The fact that this play did not go for six hides what masterful work Allen did. A massive outing against the Chiefs could have been even bigger. It will absolutely be worth watching Keenan Allen go against Dominique Rodgers-Cromartie on Thursday night. The Chargers are going to need to light up the scoreboard to win this game. It will be easy for the passing game to win the battle in the middle of the field with Woodhead and Greene; they may be able to get thirty points from those matchups alone. But to gain the forty to fifty points they will almost certainly need to beat the Denver Broncos, they will need Keenan Allen to win on the outside as well. Will the Lions continue to underperform and lose their lead on the NFC North? Will Kirk Cousins presence behind center do anything to improve the Washington Redskins? Can Matt Flynn do enough for the Packers to beat the Cowboys and their dreadful defense? Can the Dolphins upset the Patriots and keep pace with the Ravens for the sixth seed in the AFC? Will Marc Trestman’s decision to reinsert Jay Cutler into the starting lineup pay off in the short term? 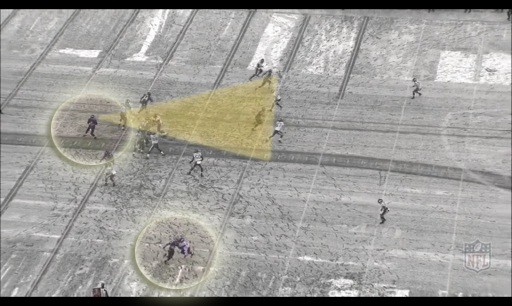 Flacco’s first move is to look off the strong side linebacker lurking underneath Smith. Once that is done he turns his gaze over to Smith. When he sees his receiver locked up with Xavier Rhodes, he snaps his head back less than a second later. Flacco knows that his offensive line, while improving, is not adept at holding their blocks for too long. The ball must get out in a hurry. He turns his attention back to the left side of the field. Even though he does get free and into the hole in the cover-two, Smith has been effectively taken out of this play. 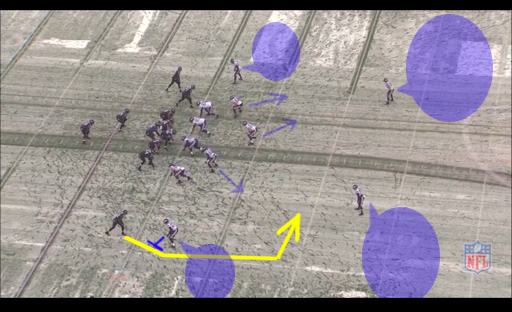 The Lions tend to play their corners in off-man coverage, not asking them to press very often. Torrey Smith has shown the ability to consistently take advantage of that sort of coverage. When the Lions play the Ravens on Monday night, it may be wise for the team to change things up. If the Lions corners can hold Smith up at the line for just a few seconds, their defensive line should be able to get to Joe Flacco for a few sacks. Unfortunately, he does not do that. Nicks makes a cut to the middle of the field and at the second image looks like he will leave the cornerback in his dust. 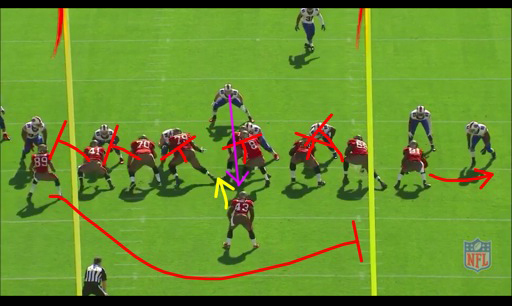 However, his cut is so slow and belabored that the corner is able to undercut the route (third image). He should be able to make an easy interception as Eli Manning has already released the ball. The cornerback fails to make the play as the ball bounces off his hands and into the arms of Nicks. This type of play shows that while Nicks stuffed the stat sheet last week, he still does not seem the player from early in his career. 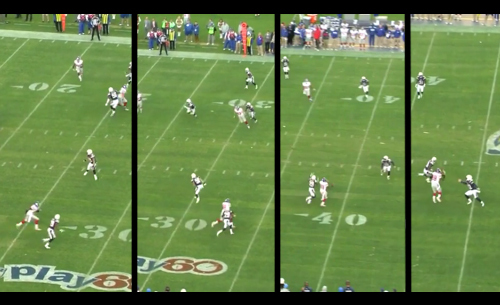 When Hakeem Nicks meets Richard Sherman this weekend, failures like this play will not end with such favorable results. Sherman has some of the best ball skills in the league, amongst defensive backs. If Nicks cannot run crisp routes with Sherman tailing him in man-coverage, you can bet Eli Manning will be adding to his season interception total. 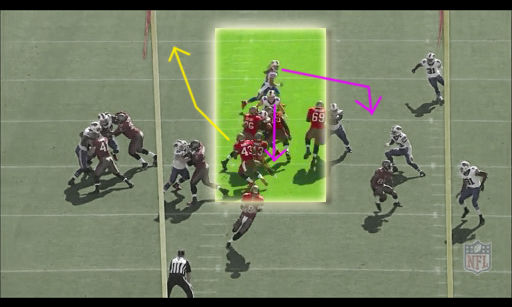 Still unblocked, Alonso tries to recover and tackle Rainey. Unfortunately, he was so far out of position he has to lung to at the running back in his tackle attempt. Alonso is easily dispelled with a swift stiff-arm from Rainey. Since the defensive backs were all taken out of the play by the Buccaneer’s deception, none of them are around to tackle Rainey. He is never touched again and heads down the field and runs into the end zone for a score. The Bills have a great defensive line, but they can only do so much to help out their linebackers. As a middle linebacker, if you are left unblocked on a play, you need to play disciplined football and make the tackles on the run. The Jaguars will be without Maurice Jones-Drew this weekend, but his backup Jordan Todman has been very impressive in limited snaps. 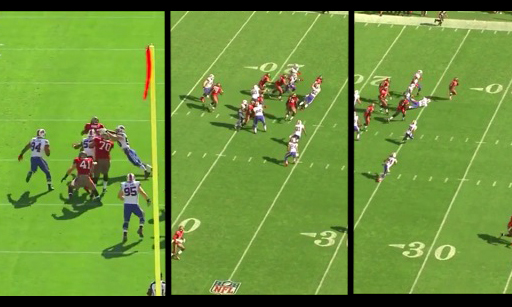 Todman shows the burst and vision to change directions quickly, which could spell trouble for Kiko Alonso. The Bills offensive line should be able to wreak havoc on the Jaguars offensive line, but it will be up to Alonso to hold up his end of the bargain and clean up runs plays.